Yesterday afternoon while my girls were snuggled beside the woodstove "studying" an episode of Little House on The Prairie, I slipped off into the kitchen to make a little thank you gift for my favorite veteran. If you didn't see the video I shared yesterday, that my father shared with me, I hope you'll take a few minutes to watch it. I tend to think I'm a pretty grateful, patriotic person–yet watching that video reminds me of how easily we take our freedoms and safety for granted. It is important to see the faces, hear the words and memories of a generation that has kept our generation free. 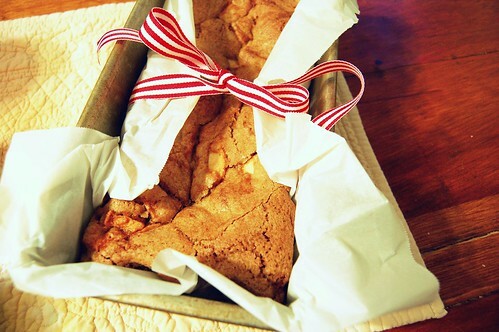 So, this little "Veteran's Day Apple Cake" is a good one. Simple, quick, and best of all it's a "one to keep, one to give" kind of cake. The recipe makes two loaves. I owe the discovery of this cake to my sister–who made it for me on our last visit. And I'm pretty sure it comes out of her church's recipe book. I swear, those little church recipe collections are full of culinary greatness. p.s. this cake does not fall in the low-fat, low-cal category. but it is high in the yum-factor. Bake for 1 hour at 350. Turn off the oven and let stand in the oven for five minutes or until loaves test done. The tops should be nice and dark and crunchy, the insides will stay moist (one of my all-time most despised words) and delicious. Now, I know it will be hard, but wrap one of those loaves up and share it with someone special. And enjoy the other one yourself. It looks scrumptious, we love all things apple around here. Do you think I could use some apples that are a little past their prime for this? We picked a few too many and I don’t want to just toss them. It is either this or applesauce. susan, i actually used some apples that were *very* past their prime. I even had to cut out a few bad spots, and it was fine. Ok, I just put one loaf and one pan of muffins/cupcakes in the oven. I only own one loaf pan! Thanks for the recipe. I can’t wait to hear how the muffins turn out! hi shana. thank you so much for your sweet comment. i’m glad you took a moment to share with me. take care. Success! I baked the muffins for 24 minutes, and they are great. My non-apple eating son even liked them. I did the sneaky mom thing and had him try it before telling him what was in it. I love that trick! I’ve bookmarked this! It looks soooo good! I am always thrilled to find a recipe that is non-dairy … I can actually eat the whole loaf. LOL I’m rethinking that … I still need to fit into my blue jeans tomorrow! Love your blog … I visit here a couple of times a month and enjoy your journaling and fabulous photography so much. k…i’m totally making that cake,it looks delicious!! and i have to tell you thati am refraining from calling my kids overright nowto show them your postand that i am not the only person in the worldwho despises the “m” word…they tease me allllll the time about that.